Enjoy the beautiful French language with these audio books! Listening to French audio books helps you acquire a perfect French accent, without any effort. Just relax on your sofa or in your car, and listen to these engaging stories in easy French. Enjoy! 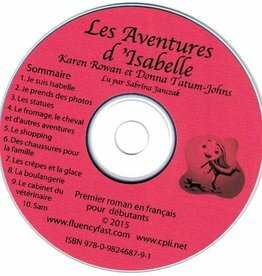 Fun and easy audio book in French for true beginners. Especially young language learners will instantly connect to the hilarious adventures of Isabelle in Paris. French audio book for level A1/A2. Victoria is being kidnapped while she is in Martinique with her son. A captivating story that you will want to hear over and over again! Buy now! Fun French audio book for beginners. Rather than get caught in the act of disobeying his mother, Brandon decides to lie to her. This causes unforeseen problems! French audio book for intermediate students. What would you do if you and your friend were stuck on a Caribean island with no money? Read more and order online! Captivating French novel for second year students. What would you do if you lost your friend's child while you were on a holiday? A captivating story! Order online now. Captivating French novel for second year students. Charles witnesses the theft of a piece of art and is now being threatened by the thief... A great listening experience! Engaging French audio book for second year students. What happens when you fall in love in a place where you know no one and don't speak the language? Find out now! French audio book for beginning students. The French city of Lyon is not what it looks like at first sight. Especially at night... Order now online!